One of our most popular and favorite post to write is an annual look at the key questions facing production agriculture in the coming year. There are always a number of important issues to consider ahead of any year, but 2017 seems to have lots of unknowns. More importantly, the questions facing production agriculture in 2017 seem to be more critical than years earlier. With that said, here is our list of the 16 key questions facing production agriculture in 2017. 1.) Are farm financial conditions stabilizing… or just getting serious? Thinking about the challenges explicitly facing the agricultural economy, this lingering question is the 10-ton elephant in the room. While the agricultural economy started the downturn in a strong financial condition, conditions have begun to deteriorate. Earlier this year Brent examined how recent conditions compare to historic conditions. Farm incomes have now fallen for 3 years in a row and we rarely see any evidence that leads us to believe that working capital and financial conditions in agriculture are getting better. The biggest issue will be whether farm financial conditions continue to deteriorate or get a lot worse in 2017. 2.) Will the jump in producer sentiment meet reality? Recently, the Purdue/CME Group Ag Economy Barometer posted a significant jump in producer sentiment. The DTN/Progressive Farmer Agriculture Confidence Index also captured similar results. Both of these indices give formal credibility to the anecdotal improvements in producer sentiment that we have noticed in the last month and a half when talking with farmers around the country. It seems producer attitudes are improving. Perhaps it is a coincidence, but we tend to think, this improved sentiment is related to the November presidential election results. How this forward-looking excitement meets current realities will be a key question in 2017. Specifically, will producer optimism translate into strong buying intentions? For whatever it’s worth, the mood of ag lenders doesn’t seem to have improved yet (Chart 11). 3.) Another Year of Above-Trend Yields? Commodity markets have been plagued with expanding inventories as a multiple-year run of above-trend U.S. yields have been strung together. Another year of above-trend yields will only add to inventories and further pressure grain markets. Or will U.S. producers catch a break in 2017 and see inventories shrink? There are lots of different views on the likelihood of another year of above-trend yields; and we’re not weather forecasters so we won’t offer our view on it. However, as Scott Irwin at farmdoc daily recently pointed out, it seems pretty clear that we have had an unusually good run of weather in the last 20 years. 4.) Will La Nina Make a Splash? Last year at this time there was a lot of talk about a summer La Nina and the possibility of much higher corn prices. In 2017 – with a weak La Nina in force- the mega-drought chatter has been subdued. This is a little surprising when comparing the drought conditions in January 2016 (figure 1) to January 2017 (figure 2). Large portions of Oklahoma, Kansas, Missouri and the South will enter the Spring with dry soils. Figure 1. 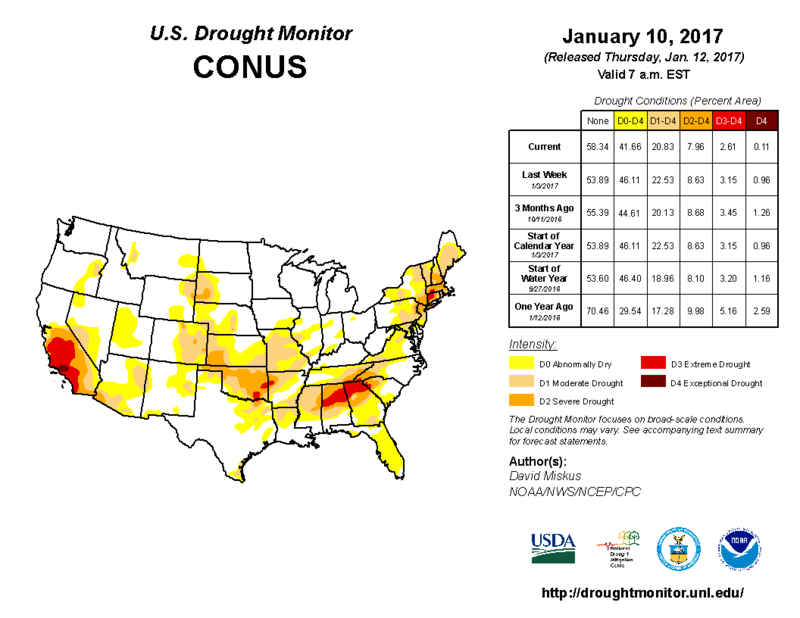 U.S. Drought Monitor, January 12, 2016 (last year). Data Source: The National Drought Mitigation Center. Figure 2. 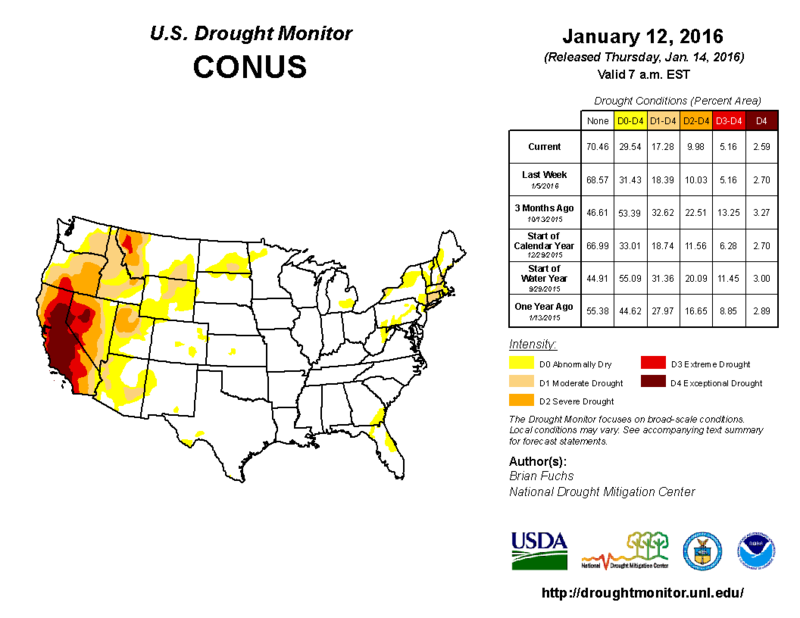 U.S. Drought Monitor, January 10, 2017 (current). Data Source: The National Drought Mitigation Center. 5.) Demand and grain exports have been strong…will it continue? One of the positive stories in agriculture has been the strong demand and exports of U.S. grains. Corn, soybeans, and wheat exports have been ahead of last year’s pace. Continued strong demand for grains will be an important source of support in the markets. Given current stockpiles, strong exports and demand will be critical. A look at 2017 planting intentions came early in January when the USDA released its expectation of nearly 4 million fewer acres of U.S. winter wheat. What will these acres get planted to? This sets the tone for producers in wheat producing regions to seek out alternative crops – mainly corn and soybeans. Currently, the corn/soybean price ratio favors soybeans. Will this continue through planting? Finally, how many acres of cotton will be planted? Cotton prices have quietly trended higher and will likely be competitive in 2017. With current grain stocks, close attention will be paid to whether producers end up with too many acres of any crop, but particular attention will be paid to planted acres of corn and soybeans. As was the case last year, one of the key things to think about is how these decisions play out at the local level and across the different regions of the country. 7.) Is wheat the canary in the coal mine? Or don’t worry about it? The agricultural outlook is bleak with wheat production, and farm financial conditions are most strained in these regions of the country. Many areas are seeing very low wheat prices. Is this a harbinger of what might be to come for other commodities or are the special circumstances of lots of low quality wheat make it nothing to be concerned about? 8.) Will there be a positive commodity surprise? Will Farmers get a (another) chance to sell at profitable levels? In 2015 and 2016, concerns about the U.S. growing season sent commodity prices higher. These rallies were short-lived, but some producers were able to market their crop near or above break-even. Many will be watching and hoping for another rally in 2017. 9.) How long can farmers hold back on capital expenditures? Producers made significant cuts to their capital expenditures in the last two years and this helped stabilize profitability. In percentage terms, the cutback in 2015 was second only to those during the Farm Financial Crisis in the 1980s. Looking to 2017, questions about producer capital purchases and how long producers are able to hold-off replacing equipment will be important. 10.) Will farmland values and cash rents continue to fall? Most of the data show both farmland values and cash rents started to decline in 2016. For instance, data from Indiana showed that cash rents fell by nearly 11% on average quality farmland in 2016 and Purdue University experts expect another decline in 2017. As we pointed out last year, the current level of profitability in production agriculture makes further declines likely. How much further rents decline will go a long way in determining whether farm profits stabilize and whether working capital levels begin to stabilize. Land values will play a key role in the financial condition of the sector as well. Today’s relatively strong farmland values currently provide a significant amount of credit reserves, as farmland values decline those potential credit reserves start to contract. 11.) What Input Expenses will fall in 2017? 12.) How does policy under the Trump Administration shape out? Just months ago it seemed the only question ag policy gurus were debating is when to start the upcoming Farm Bill discussion. Now there seems to be an unending line-up of policy issues that could impact agriculture surfacing in the near term. Trade, labor, and the Renewable Fuels Standard (RFS) have been sent to a purgatory status while the Trump Administration ponders their fates. Even NAFTA – which hasn’t been on anyone radar screen for years – has been facing rumblings. In short, it’s basically the wild west for policy and policy makers. Hold onto your hats; things are likely to get bumpy. 13.) How much will interest rates rise (if any)? The Fed announced a small hike in interest rates in December- it’s first for the year. Many thought a hike would come earlier in 2016. What do interest rates have in store for the 2017? Given that the economy is at (or near) “full employment” (or a healthy level unemployment), keep an eye on inflation, especially growth in wages. Overall, interest rates are currently near historic lows and have been an important – often overlooked – aspect of the recent agricultural boom. Furthermore, low interest rates have cushioned the impact of the agriculture’s margin squeeze. Looking ahead, small interest rate hikes will likely have small impacts on producers operating expenses. Long-term, significant adjustments to interest rates could significantly impact farmland values. 14.) What happens with Ag Trade? There are short and long-run implications to this question. Specifically for 2017, will U.S. grain exports clip-along fast enough to help reduce the burdensome inventory levels? Further down the road, what does U.S. trade policy look like and what are the implications for agriculture? The top-three international buyers of U.S ag exports, Canada, China, and Mexico, collectively account for 44% of all ag exports. In 2017 we will get a glimpse of the tone and policies that will direct how our trade relations – especially the top-three- will begin to unfold. Will ag exports grow, contract, or remain about the same with these countries? Will new buyers emerge? 15.) Where do exchange rates go? A stronger U.S. economy – relative to the other global economies – means a stronger (or more expensive) dollar. This can create a headwind for U.S. ag exports. Not only is the strength of the dollar important, it’s important to keep an eye on the relative exchange rates with major buyer and competitors. For example, in 2016 the Brazilian Real strengthened relative to the U.S. In early 2016, the exchange rate was 4.1 Brazilian Reals to 1 U.S. Dollar. In early 2017, the rate has gone to 3.2 Reals to 1 U.S. Dollar. This has been good news for soybean exports. 16.) How does the broad economy perform in 2017? When thinking about the macro economy issues – interest rates, exchange rates, inflation, etc. – the overall performance of the U.S. economy in 2017 will be a key driver for all these factors. This is especially true if the U.S. economy grows at rates much faster than other developed counties. In our opinion, the macro-economy and government policy are set up to play a much larger role in the agricultural economy in 2017 (and beyond). Many unknowns exist. While many are optimistic about the future, it’s important to note that many of the unknowns and moving pieces can play out in unpredictable ways. More directly, given the macro-economy and government policy unknowns it is extremely difficult to understand how the impacts might affect agriculture. Furthermore, it’s extremely difficult to conclude – at this point- that these to-be-determined factors will be unequivocally positive for the U.S agriculture.